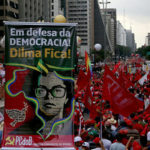 The 38″‘ Convention of the Communist Party of Canada condemns the imperialist-backed coup in Brazil and expresses its solidarity with the workers’ and peoples’ organizations that are resisting this attack on democracy and progress in Brazil. The coup was achieved through impeachment votes against democratically elected President Dilma Rousseff, based on exaggerated and selectively-applied charges of corruption. The impeachment, and the anti-government demonstrations that preceded it, were orchestrated by oligarchs within Brazil who were supported by the United States government and its imperialist allies. These forces were unable to defeat the progressive coalition government through four successive national elections, and have used impeachment as a way to retroactively overturn Rousseff’s 2014 election victory. Immediately after the impeachment, the right-wing, anti-people agenda of the coup plotters became apparent. The illegitimate government of Michel Temer has launched a multi-front attack on Brazil’s most progressive social and political achievements. They have installed an all-white, all-male cabinetthat is closely linked with US corporate interests and is openly hostile to the social movements who represent the vast majority of Brazilians. The coup leaders are expressly opposed to the elected government’s policies of labour rights, social inclusion, investment in education and health, and redistribution of wealth. Additionally, the US government wants to use the coup as a way to weaken and reverse the general pattern of progressive and democratic change that is moving throughout Latin America, and to reassert its control over the region. Imposing “regime change” in Brazil is also a concrete part of imperialism’s effort to weaken the BRICS group of countries (Brazil, Russia, India, China and South Africa), which have emerged as an economic and, in some cases, political challenge to the might of Western imperialism. Reorienting Brazil, Latin America’s largest economy, strongly toward the United States would have an enormous effect regionally and globally. 2. reject and oppose all foreign interference in Brazil’s sovereign affairs. We encourage all labour and progressive forces in Canada to oppose the coup and to express active solidarity with the working class and people of Brazil and their democratically elected government. Näo ao golpe, sim ao povo! No to the coup, yes to the people!